Are you having a hard time locating a short circuit on your electronic circuit PCB board? Short circuit repair can take you hours and hours to troubleshoot. A short-circuit may happen due to misalign component assembly or after some rework on your circuit board. It could be a solder bridge across adjacent pins/via, or it can be due to a poorly fabricated PCB board. A small particle stuck between the pins of IC chips can also result in short circuit. Short circuit on a dense PCB board can be very challenging to detect. This is especially true if your short circuit occurs on the power supply trace which is usually routed across the circuit board. Short circuit location can be almost everywhere. In many situations, a simple short circuit detected can Drive You Crazy, Spending Hours Troubleshooting wondering where the shorting is. You may be left with no choice but to desolder your components one by one to locate the short, or simply giving up the repair and discard the faulty circuit board into the rubbish bin. Built-in with a sensitive resistance sensing function… A handy troubleshooting tool that every electronic technician or engineer must have. 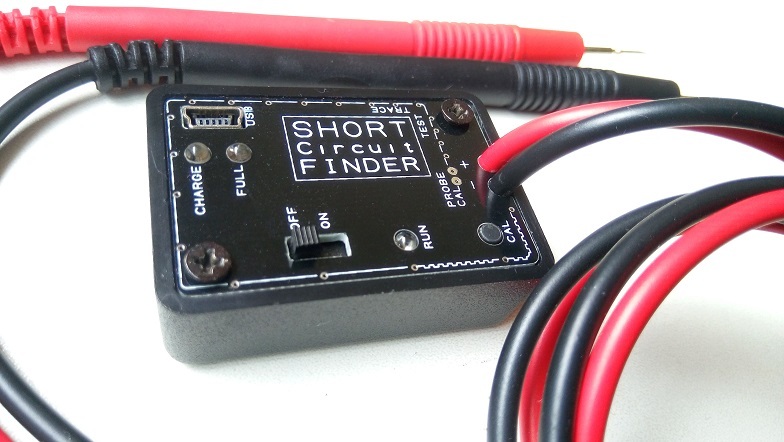 This Short Circuit Finder is able to help you narrow down the location of the short circuit. It is so sensitive that a small change in the resistance can be differentiated. There is an Audible Beep Tone to help you gauge the short circuit distance. As the short circuit gets closer and closer, the frequency of the audible beep tone increase. You can then progressively probe your circuit to narrow down the short circuit position. Check out this video demonstration. 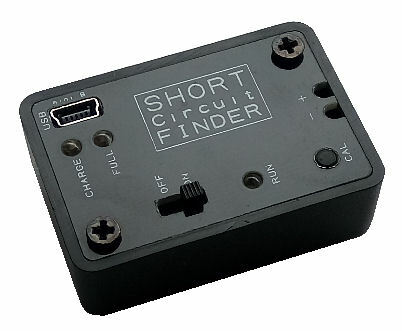 PIC-121 Short Circuit Finder is useful in narrowing the region and eventually allows you to locate the precise location of your short circuit. 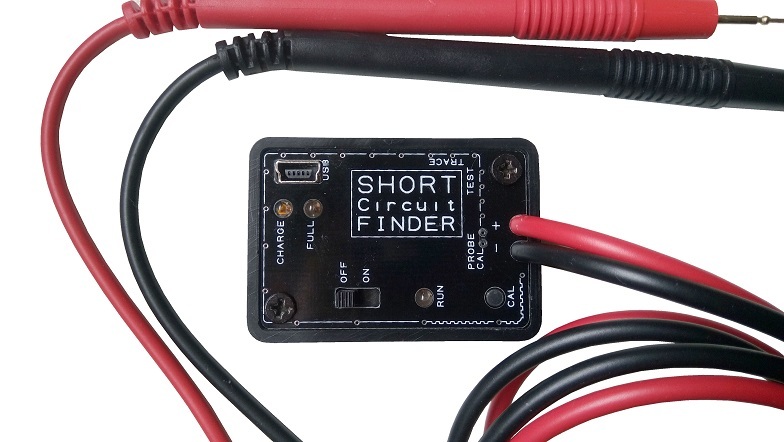 When a short circuit is first detected by your digital multimeter or ohm-meter, you can use a short circuit finder to help you locate the short circuit region. As you probe nearer and nearer to the short circuit location, this finder will beep faster and faster. 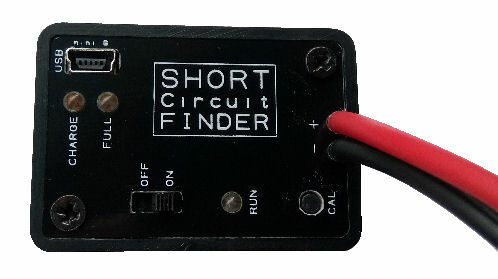 This PIC-121 Short Circuit Finder tool is Simple and Easy to use. Switch on the PIC-121 Short Circuit Finder device. You should hear some beeping pulse. Remove the cover of the probe. Position the tip of your probe to the PROBE CAL pads. These pads are internally shorted to simulate a shorted location.. While your probe is still on the PROBE CAL pads, press and releases the <CAL> button to calibrate the probe. You should be able to hear a very fast beep tone. This is the beep tone of a short circuit. When you remove your probe from the PROBE CAL pad, the beep tone will become slow. This indicates that the short circuit is a distance away. Probe the strategic test points on your PCB circuit board to pinpoint the location of your short circuit. When you hear the same fast beep tone, this will be the location of your short circuit. NOTE: When you have finished using the Short Circuit Finder, remember to cover back the probe to protect the tip of the probe. It is important that you take care of the probe. Audible Beep Tone to help you gauge the distance of the short circuit. Audible Beep frequency increase as the short circuit location gets nearer and nearer. 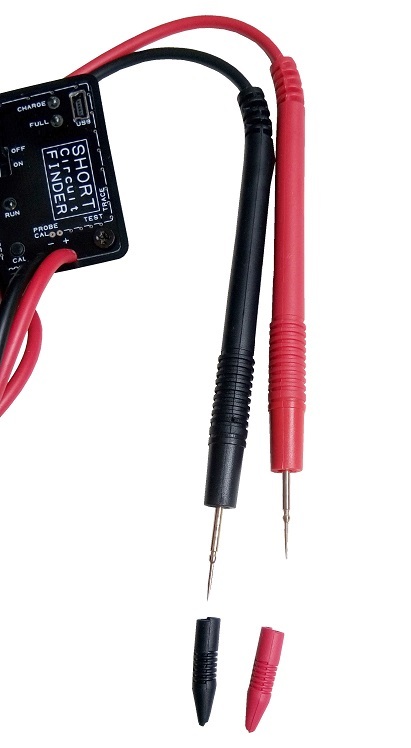 PROBE CAL pads and a CAL button to help you calibrate your probe for the short circuit. Test pads on the border of the panel to help you test the probe. Battery charge and detection status indicators. Small size (50 x 35 x 20mm) and light weight. Please note that the product WILL NOT be shipped out with the rechargeable battery due to the Shipping Restriction. 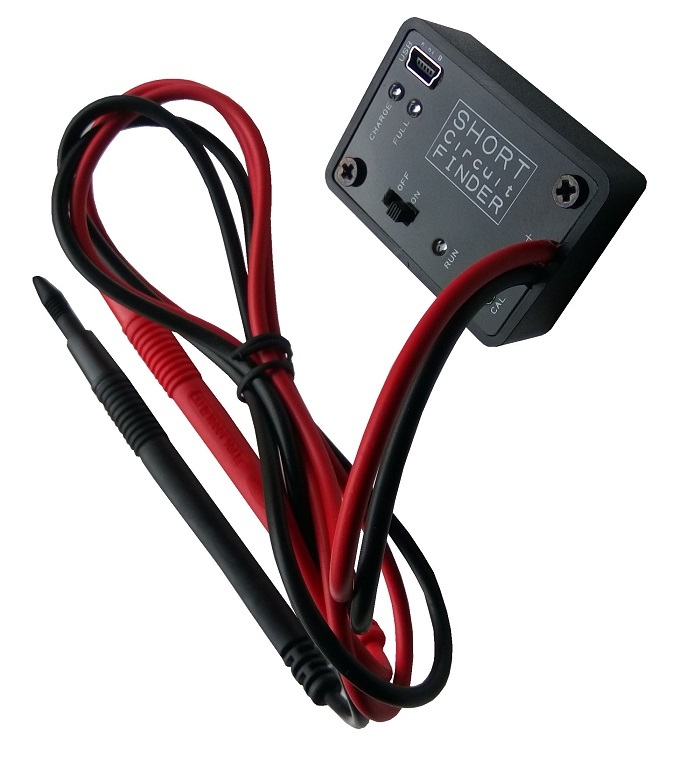 This device can operate directly from the USB cable via the mini-B socket. Instruction: Unscrew the two screw on the front panel, and insert your battery into the battery holder. 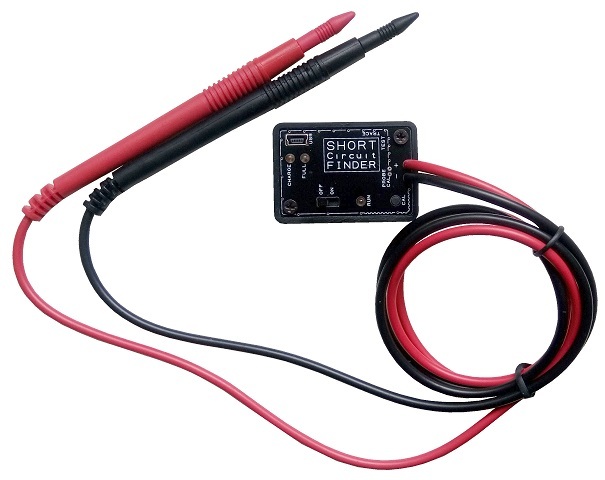 *** Install only rechargeable button cell battery into the Short Circuit Finder. You may use non-rechargeable battery but you have to remember not to plug-in the USB cable onto the Short Circuit Finder as it can damage the device. 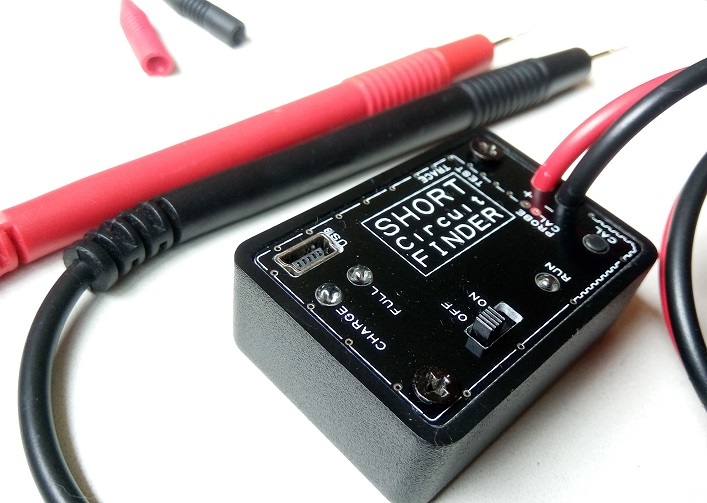 *** Short Circuit Finder use the principle of measuring the low resistance of a trace path. 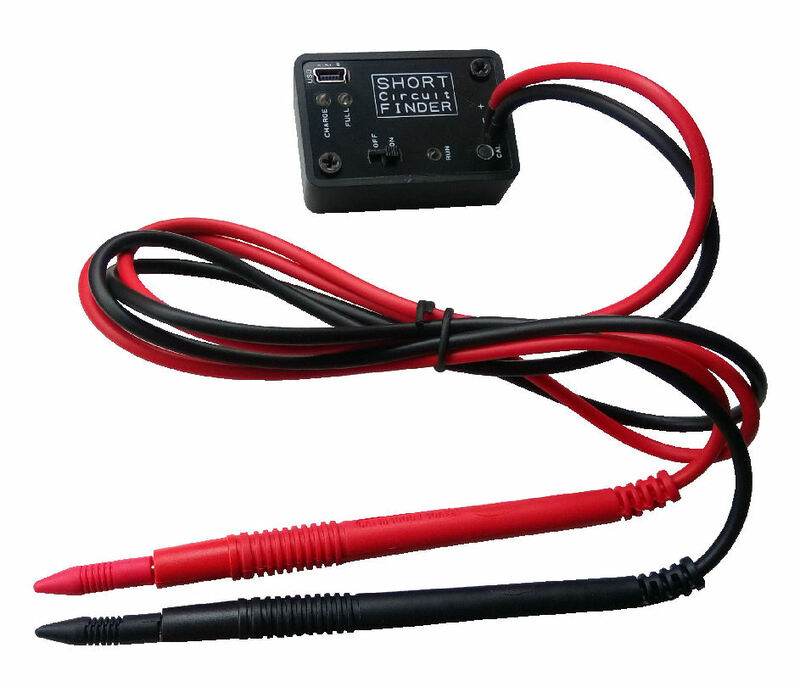 It is useful for detecting a short circuit between traces. It is not so suitable for detecting of copper filled power planes. 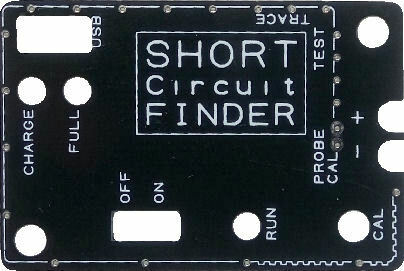 There are test pads available on the panel of this Short Circuit Finder. 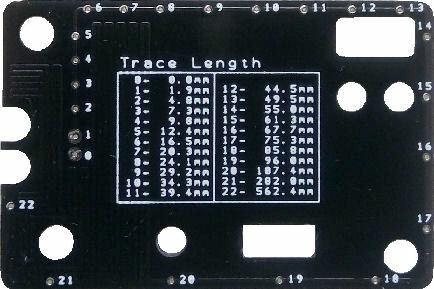 You can use these test pad to get yourself familiarise with the beep tone to the various trace distance (resistance). The test pads are located on the boundary of the panel. You should notice a very long white line near the border of the panel. This line starts from the two PROBE CAL pads all the way around the panel’s border in an anti-clock path and ends near the CAL push button. There are many vias pad along the line. These test pads are there to help you test the probe at various short-circuit distance. The 1st 2 pads which are also the PROBE CAL has the shortest trace. You should be able to detect and hear the fast beep tone which indicates the short circuit position. As you probe further and further away down the line, you should hear the beep tone frequency decreases. This tells you the short circuit location is getting further and further. 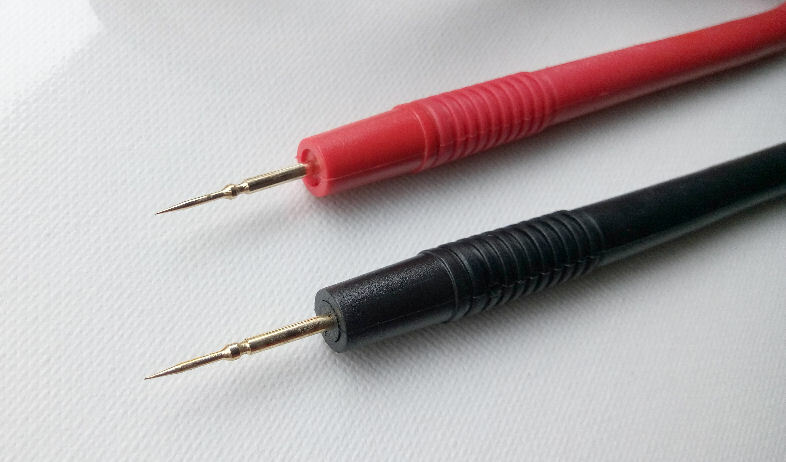 Very fine and sharp gold plated probes (red/black) allows you to probe near the IC chip fine pitch pins and high density area. A Must-Have Tool for electronics technician and engineers who often do hands-on troubleshooting circuit boards. 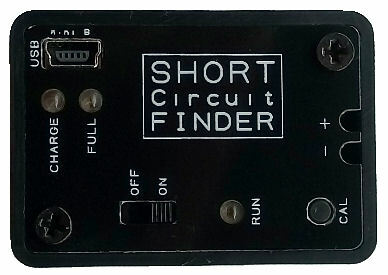 Contact PIC-CONTROL for other enquiries for this Short Circuit Finder tool. We also provide electronic engineering services to assist you with design, fabrication and troubleshooting.